OPTIFAST® therapy is a comprehensive approach to treating obesity, and is available at hundreds of hospitals and clinics in the U.S.A. and Canada. More recently the program has been sold around the world (including New Zealand and Australia) via pharmacies. The program was originally produced by Novartis Medical Nutrition Corporation, but now is owned by Nestle. It is designed for obese people – those overweight by 50 pounds or more (about 22Kg), or having a body mass index (BMI) greater than 30. Overweight individuals (those with a BMI of 25 to 30) who experience medical problems caused by their weight may also benefit from the program. Check your BMI to see if you fit the criteria. 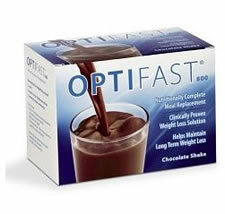 The OPTIFAST® program utilizes the expertise of physicians, registered dietitians, and trained counselors with a high quality, calorie controlled liquid nutritional formula. OPTIFAST uses a Weight Management Learning System curriculum to accomplish individual weight management goals. The OPTIFAST program was the first of its kind when developed in 1974, and now has long-term experience and documented success, with more than a million people treated to date. It is based on well-researched treatment approaches, and provides lifestyle education, personalized support, and portion controlled formulas to develop and maintain a healthy new weight and lifestyle. Initial medical and lifestyle evaluation, then ongoing medical monitoring of health while losing weight. Counselling to develop the lifestyle, nutrition, and activity to manage your new weight long term. The program is commonly offered as a 26-week plan, including 12 weeks or more of complete meal replacement, up to 6 weeks of transition to solid food, concluding with a regular diet to be maintained thereafter, and features up to 20 weeks of nutrition and behavioral counseling. Many participants in the program and its variations testify to its success, although it appears to require a great deal of tenacity to ‘stick with it’, and by some accounts can produce some uncomfortable side-effects, possibly due to the nature of the liquid diet regimen. However, even a morbidly obese person unable to exercise, can still lose weight because of the low calorie intake in the prescribed liquid ‘shakes’. Based on published surveys of participants and on anecdotal evidence, one may conclude that a proportion of those who enter the program do not complete it, and that not all who achieve their initial weight-loss objective succeed in maintaining it subsequent to the program’s completion. OPTIFAST website – Check out the official source and content of the program. Please some one email me for the REAL and HONEST answers to my questions. Works well if you stick to the program. 12 weeks with shakes or bars or soups and 2 cups of vegetables will make you lose weight, generally at least 20 kilos (40 pounds in the US speak). THE KEY is how you come out of that program. GO SLOW, go with 2 replacement meals and a light low carb dinner and a casual treat say once a week for a few weeks, then gradually reintroduce lunch etc etc. This is also when you should ramp up exercise (nothing crazy) but longer walks, do some situps, take the stairs, run a few metres! Maintenance is all about slowing re-establishing a normal diet but not going back to your old habits. I have started the program today in preperation for gastric banding in a few weeks. The shakes make me feel sick is that normal? the bars are ok and trying the desert tonight instead of the shake. The shakes have 20 carbs but that is not NET carbs. They count them like Atkins. You take out the fiber to get the NET carbs. So the Carbs per day are actually less than stated. There are various online outlets to purchase Optifast. There are even some ebay sellers offering these items. I am interested in purchasing optfast 800 my doctor has agreed to supervise my weightloss but I can’t find how to purchase this? I started the program 3 days ago and I am wondering how a person loses weight with the high carbs. I am on 5 packages a day and that’s 100 carbs. How does this program work with so many carbs? Hello! I work at Island Health Weight & Wellness in Oahu, HI and we offer the Optifast program. Just thought maybe i could answer some questions I saw on here since I’ve been working with patients on this program for 16+ years. TAN: Watermelon has natural sugars in it and more importantly it contains calories that will be detrimental to your diet. If you are craving something other than Optifast, ask your medical provider if there are any ‘free foods.’ On our diets, we allow celery and a few other veggies to help with cravings. Linda: You should also ask your medical provider if tea w/o sugar is okay. On our program we tell patients to drink 64oz of ONLY water each day. Lisa: I’m sorry to hear you don’t get counselling with the program, I think thats a very important part of many patients success. As for your eyesight, if you are having any changes in eyesight you should be alarmed. However, a common side effect of being on full Optifast is dizziness which some people think is a change in their vision. You can never be too careful with your eyes though. If you were our patient I would want you to call so we could test your vision. Phreddie: many people find that once they start eating some table foods after doing full Optifast, they start to plateau or regain weight. However, during the course of the program, most patients come to monitor their weight changes much better in their daily lives and have the tools to change their eating habits as they make the transition back to normal food. Some of our patients who have met their goals continue to use the Optifast products for a couple meals a day and eat table food for the others. This serves to keep their weight down and remind them that they need to remain conscience of their weight. Kirsty: Diarrhea and moodiness are very common side effects of Optifast during your first week, I’m sorry to hear you are experiencing them. The first week is typically the most difficult for people as their bodies adjust to the chemistry of the food products. If it continues to be an issue, you may need to change your diet to include some table food but definatly keep your medical provider aware of the problem. I wish everyone longevity and great success! Be Well! this is only my first day and im so hungry im only having the shakes and lots of water someone told me that watermelon has no fat at all in it does anyone know if thats true. I used this plan back in 1988 and lost over 60 pounds. Kept it off through exercise and a low fat diet until my arthritis prevented me from getting adequate exercise. After the first week I had no hunger. However, due to the ketosis I almost always felt cold. Ironic, since normally I feel warm. The social situations are indeed very troublesome. Basically, part of the deal is to greatly cut back, or be prepared to stand out in the crowd. Then there are always the “helpful” people who try to convince you that just one slice of German Chocolate cake couldn’t possible do any harm. Some of these people are actually trying to make you fail, because they did. Gotta just avoid them. This is a great program; however, it is very important to watch adding toooooo much starch when going back on food. Potates and bread must be added very slowly. I lost about 40 pounds and am almost 60. I have gained back 25, but am now plateaued. Those starches reall;y interferred with my keeping pounds off. They added too much “sugar”, even when I was careful with calories. Wish this product was available without going to a clinic. I have had to go to a different product to continue getting a liquid nutrition meal. the one thing that helped me get started on this diet was to make a list of things that are 100 calories or less. like, tuna, raw veggies for salad, chicken, cabbage, peanut butter and celery, crab meat, v8 juice to make soup etc. I counted my calories to eat less than 900 a day eating no bread. it helped me prepare for the optifast. I had to go on optifast for the lap band surgery april 16th… Next week. I have four more days to go and it was not easy. the only problem I had was a burning sensation in my tummy until I got use to such low calories. the 3rd day I had a tsp on tuna to take away that feeling, day 6 that burning came back and I had a tsp of peanut butter. other than that I haven’t had any solid foods. i like the shakes they arent bad. I would put the shake in a bowl and freeze and eat it like ice cream at night. what a neat snack. I thought the tomato soup would be a nice change from the shakes at night but I thought the soup was NASTY. so I am only taking in 4 shakes instead of 5, which is less than 800 calories. the crystal light with zero calories helps that hunger pang. exercising does help any temptations, keeping your hands busy like reading writing,or crocheting also helps. I did Optifast in 2004. I lost about 30lbs very quickly and I kept it off for quite a few years. I did it through Kaiser in California. There really aren’t any side effects. I would love to do it again but I can’t find where to go or to buy the product. I’ve been doing Optifast for a week in preparation for gastric bypass next week. The hard part is the evenings. I’m thinking about snacking on celery. It’s just water right? Does tea without sugar count towards the water intake quantity? I did this plan 10 years ago and lost 131 lbs. … Started Optifast again 4 weeks ago and have lost 20+ pounds… 🙂 I do a modified version of the diet mixing a once daily garden salad with chicken or tuna fish along with the Optifast… I don’t care what diet you do the solution is real easy … No Carbs, No Sugar, No Salt and you will lose weight… I enjoy the counseling and the weekly weigh-in it motivates me… good luck! it isn’t easy..
does the weight stay off? or do you gain it all back when you switch back to solid food? Hubby and I lost 185lbs combined… the trick – listen and remember your counseling sessions. What motivates each of us is different. I’m trying for a 3rd time now to get through week 1 – very hard when everyone else is eating “real food”. Does it get easier? On my second day of the powder, having lots of abdominal discomfort and watery diarrhea…argh! I did this diet a long time ago and i would go out to dinner with my family and order a glass a water and bring my powder mix with me and that is all i had. I did drop 25lbs rather quickly but gained about 50lbs back after i couldn’t afford the counseling anymore! How do you manage going/eating out while on Optifast? i find it hard since there is no specific diet plan in its meal. can you provide one?